Scores of retail chains are offering huge end-ofthe-season sales and if you visit a mall, the ‘up to 50% discount’ sign is the norm these days. But with the stock markets being hammered on account of global weakness, clothes aren’t the only things available at half the price. Many stocks are now trading over 50% off their early-January levels. The sensex hit an intraday high of 21,206 on January 10, but has gone through a rough patch since then. On Tuesday, the index dropped by 338 points to close at 16,340, an over five-month closing low. The index has not seen this level since end-September, when an unexpected 50 basis point rate cut by the US Federal Reserve triggered a phenomenal bull run that took the index from 15K to 21K in just over four months. And now it has come nearly a full circle with the index back at low 16K levels. So is it a buying opportunity, especially for those investors who watched from the sidelines during the last rally? The thought is tempting when you check stock prices. 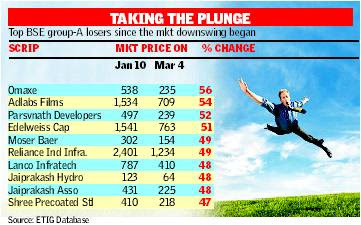 At least 15 group A stocks, that is mainly large-cap stable companies, are trading over 45% lower than January levels and about 50 are down by over 30%. Leading the laggards’ pack in this group is realty major Omaxe, down a little over 56% to Rs 235 from Rs 538 on January 10. Adlabs Films is also trading 54% lower since its January 10-level. : A beneficiary of tip-off about inside information should not be allowed to go scot-free and there should be specific penalty for a ‘‘tippee’’, Sebi suggested in a consultation paper released to amend regulations on insider trading prohibition. It has also proposed to do away with criminal penalties for violating a simple or process-based violation of insider trading prohibition norms.